Bio | Jennifer Lynn Stoever Ph.D.
Jennifer Lynn Stoever received her PhD in American Studies and Ethnicity from USC. Her dissertation, “The Contours of the Sonic Color-Line: Slavery, Segregation, and the Cultural Politics of Listening” was a 2007 finalist for the American Studies Association Dissertation Prize. She serves on the editorial boards of the Journal of Popular Music Studies,Sound Studies, and Social Text. 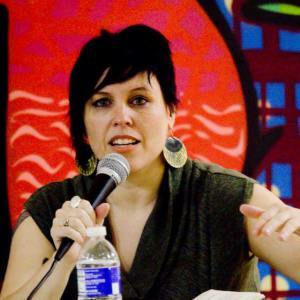 She has published in Social Text, Social Identities, Sound Effects, American Quarterly and Radical History Review among others; most recently her article “Fine-Tuning the Sonic Color-line: Radio and the Acousmatic Du Bois“ was published in Modernist Cultures and is the featured online article of the issue. During 2011-2012, she was a fellow at The Society for the Humanities at Cornell University, participating in the research group on Sound: Culture, Theory, Politics. Currently Associate Professor at SUNY Binghamton, Jennifer teaches courses on African American literature, sound studies, and race and gender representation in popular music. She also is the project coordinator for the Binghamton Historical Soundwalk Project, a multi-year archival, civically-engaged art project designed to challenge how Binghamton students and year-round residents hear their town, themselves, and each other. She is also Co-Founder and Editor-in-Chief for Sounding Out! : The Sound Studies Blog and her book The Sonic Color Line: Race and the Cultural Politics of Listening was published by New York University Press in 2016. To cite: Jennifer Stoever, “Splicing the Sonic Color-Line: Tony Schwartz Remixes Postwar Nueva York,” Social Text (Spring 2010): 59-85.